In many ways, the search for mysterious kingdoms inspired early Spanish explorers to move northward along Mexico's central plateau toward and beyond the Río Grande. Later, Franciscan missionaries, Hispanic settlers, and military personnel established missions, settlements, and forts south of and along a rugged frontier that stretched from Mexico City to Santa Fe, New Mexico, and from California to Florida. 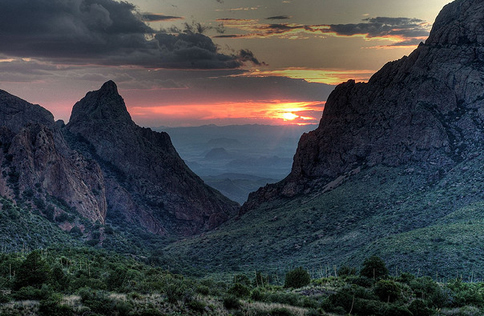 In the interior, a riverine frontier formed along the Río Grande within an area from El Paso to Big Bend and Eagle Pass. Despite its importance to Spanish colonial expansion, the history of the area has had little study. Yet that region was the scene of much activity in the period from 1580 to 1700, and its history is intriguing partly because it pointed the way to the eventual founding of Texas. Although Spanish entradas to New Mexico explored the area of La Junta de los Ríos, the confluence of the Río Conchos and the Río Grande, Spanish advances east of the Pecos River at its junction with the Río Grande were slow in developing. In 1535, Cabeza de Vaca and his three companions came through the area. Having made their escape from the Texas coast toward the Balcones Escarpment near San Antonio, Texas, the men headed southwest to the Río Grande in the vicinity of Devil's River near present-day Del Río. Proceeding northwestward, they reached the Pecos River. From there they went toward the Chisos Mountains, and once in the area, they approached Santa Elena Canyon in present Big Bend National Park. Natives led them over fifty leagues of desertscape and rough mountains, probably the Davis Mountains. Finally, the four castaways walked within sight of present Presidio and marched northwestward toward present El Paso or Las Cruces before leaving the river and making their way to safety in Sonora. However, Spanish officials did not take notice of the importance of that segment of the river until 1590, when Gaspar Castaño de Sosa and his settlers crossed the Río Grande near present Ciudad Acuña in an illegal bid to settle New Mexico. As there had been little activity in the area, their interest was short. Slave runners had crossed north of the river for nearly two decades, however, and had gathered knowledge of the region. Thus, by the 1600s, much was known about the Río Grande. Renewed interest in the river east of Eagle Pass resulted in rumors that the Dutch had entered the Gulf Coast and threatened the Spanish claim to Texas. In summer of 1638, García de Sepúlveda left Cerralvo (Monterrey) and reaching the Río Grande south of Mier traced it to a point near present Brownsville. Later in 1663, Alonso de León, the elder, explored the Río Grande near its mouth to check for any intrusions by foreigners, but found none. In the interior, a real threat to Spanish interests existed. After 1600, Indians from the north, beyond the Río Grande, increasingly led raids against Spanish settlements in Coahuila, prompting Spanish officials to send punitive expeditions across the river. In 1663, Juan de la Garza led one of the first expeditions northward and fought a battle with the Cacaxtles near Eagle Pass. Two years later, Fernando de Azcue led a second punitive expedition to Eagle Pass with measured success, bringing temporary peace to the area. Between the 1660s and the 1690s, the origins of the Camino Real de Los Tejas National Historic Trail evolved from a series of expeditions that explored northward of Saltillo, Mexico, through the San Antonio River Valley to the East Texas missions and Los Adaes, the first capital of Texas. Slowly the frontiers of Chihuahua, Coahuila, Nuevo León, and Tamaulipas moved toward the Río Grande. 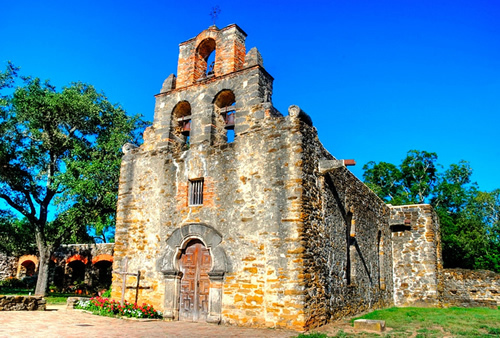 The history of the Camino Real de los Tejas grew out of Spanish advances into Texas, particularly when Franciscan missionaries advanced the mission frontier beyond the river, and by 1676, the Spanish began to evangelize a tribe known as the Tejas, north of the Río Grande. The search for foreign intruders contributed to the development of the Camino Real de los Tejas. In 1684, the French under René Robert Cavelier, Sieur de la Salle, established a fort in east Texas. In the course of establishing his fort, La Salle undertook two expeditions into the interior of Texas, one of which reached the Río Grande somewhere between Del Río and Eagle Pass. Unsettled by the threat, the Spaniards quickly began a series of land and sea expeditions to locate and destroy the French position. In the end, the Indians of east Texas beat the Spaniards to the French. The Spaniards learned that after La Salle’s own men murdered him that the Indians destroyed Fort St. Louis. The French scare prompted a serious Spanish effort to settle Texas before another European power could do so. The Spanish sent missionaries to found mission fields in east Texas as a means of establishing an effective claim. By 1691, they named Domingo Terán de los Ríos governor of the Province of Texas with instructions to establish eight missions among the Tejas and neighboring tribes. His party crossed the Río Grande at Eagle Pass and continued to the Nueces and on to east Texas. That entrada made history as the founding expedition of Texas proper. The Spanish established the first capital of Texas at Los Adaes in present Louisiana and blazed the road for the establishment of San Antonio, and in 1716, founded the Villa de San Antonio de Bexar. Within the boundaries of Amistad National Recreational Area along the United States-Mexico boundary near Del Río, Texas are archeological sites representing Native American occupation of the area from approximately 8,000 B.C. to the time of the first Spanish explorations through the region. A number of pictographs depict the historical themes mentioned above of missions, horses, and people wearing European-style clothing. The early and seemingly ephemeral Spanish presence along the Río Grande between El Paso and Eagle Pass had made an impression among the various tribes of the region.